Darien’s Geoffrey Hubbard, left, and Ridgefield’s Kent Coleman jockey for position during Tuesday’s 1-0 win by the Blue Wave. DARIEN -- Locked in a defensive standoff for the better part of the afternoon game at home against Ridgefield, Darien was in need of a spark. And forward Eric Kanigan provided it, scoring the game's only goal 10:28 into the second half, lifting Darien a 1-0 win. After a first half which was mired in a stalemate, Darien (7-0-1) was awarded a corner kick just over 10 minutes into the second half, its third of the game. On the corner, Darien's Matthew Collier lofted the ball toward the Ridgefield net. Kanigan settled the ball before blasting it past Ridgefield goalie Kyle Gurtowski. "We got the ball put in and it was a bit fortunate the way it came to me. I just took a touch and put my foot through it," Kanigan said. "It feels great to turn the team around after last year. We knew we were a good team, we knew we could challenge anyone in the FCIAC and that's what we've been doing. In that regard, it's not really that much of a surprise to our team." Darien had several opportunities to extend its lead in the second half, but a few missed scoring opportunities combined with effective goaltending by Gurtowski kept the score at 1-0 in the waning minutes. Darien's Jack Fisher was equally impressive in net, stopping five Ridgefield shots to keep the Tigers off the scoreboard. In the first half, Fisher made two sharp saves, diving to his left on both to rob Ridgefield's Adam Findlay and Joey DeVivo of potential tie-breaking goals. But Fisher saved his best save for the second half. With the game still scoreless and just over 37 minutes remaining, Fisher leapt high to get his right hand on the ball, deflecting Sean Avellino's shot wide of the net. "He was excellent in goal; he's played very well the last four or five games," Darien coach Jon Bradley said. "He kept us in it and he kept us alive until halftime. Then we picked it up and played a good second half. It's a good start to a tough three-game stretch." 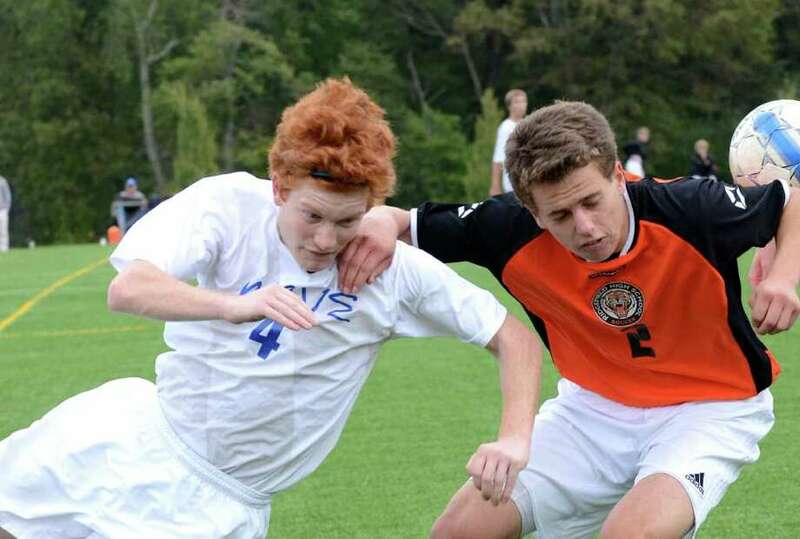 For Ridgefield (2-5-1), losers of three straight, an inability to finish off its scoring opportunities has been an ongoing issue, according to coach Phil Bergen. "All of our games have been similar. We haven't necessarily been an inferior team, but (Darien) finished and we didn't," Bergen said. "(During scoring chances) they need to stay calm and hopefully that will make the difference on those plays." Still unbeaten at the regular season's midway point, Darien has already won five more games than it did during all of last season, but that doesn't mean the Blue Wave are getting complacent. "We just need to remember that we can't take anything for granted," Kanigan said. "These wins have been hard fought and we love the feeling of winning, so none of us want to give that up." Darien looks to stay unbeaten when it travels to Wilton on Thursday. Ridgefield attempts to get back on the winning track when it travels to Norwalk on Thursday for a 7 p.m. kickoff.